Move over chicken and rice, there is a new dinner in town. If you are watching your macros, there is a lot more in this world than eating just chicken, rice and broccoli. Of course, if you have goals like competing in a bodybuilding show then, by all means, you do you, boo. But eating a healthy dinner doesn’t have to be so bland and boring. 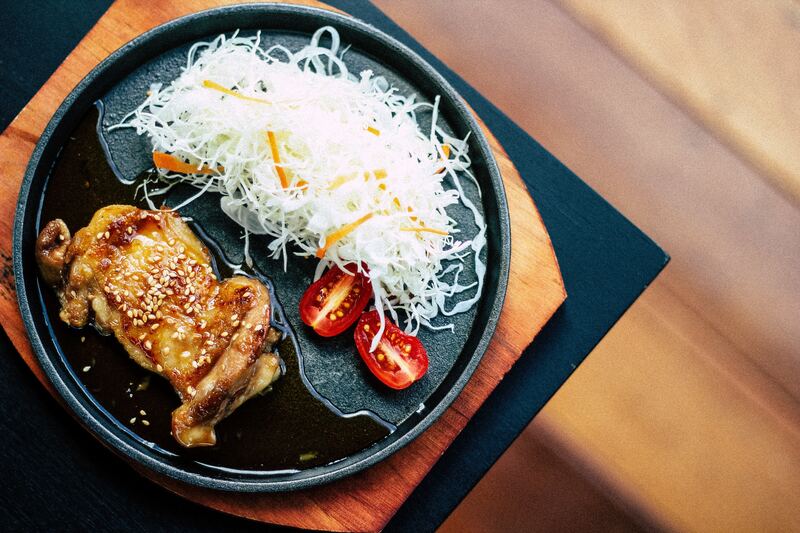 Don’t you wish you could dive into a big bowl of chicken teriyaki and not feel the guilt? Well, you can if you prepare it in a more healthy way. See traditional chicken teriyaki bowls are high in fat, calories, sugar, and sodium. Teriyaki sauce can also be high in sodium and sugar, so this is a huge component that needs some healthifying. The key is to eat teriyaki chicken is to prepare it using healthy cooking techniques and pair it with other nutrient-dense foods. This recipe we are about to share with you can also get you eating dinner in just 20 minutes. 1. Place ginger, soy sauce, garlic, wine vinegar, honey, garlic, and sesame oil into a large bowl and mix. 2. Add the chicken to the bowl of marinade and let it sit for 1-2 hours to marinate. You can do this the night before or before you leave for work so that the chicken has been marinating for plenty of hours to bring in all that delicious flavor. 4. Add brown onion and peppers into the pot and cook until onion becomes translucent. 5. Add rinsed rice and stir for 30 seconds. Add chicken stock and stir. Cover with a lid and bring to a boil. Turn the heat down to a light simmer and put a timer on for 15 minutes. 6. In a large non-stick pan, cook chicken until golden and cooked through. Before it is done cooking add in the broccoli florets and cook until cooked to your liking. 7. Now everything is cooked and it is time to build your bowl! 3 Foods For Your Skin!